Today the 100% electric Nissan LEAF marked another milestone in the history of EVs as it passed the 50,000 sales mark, reinforcing its position as the best selling electric vehicle of all time. 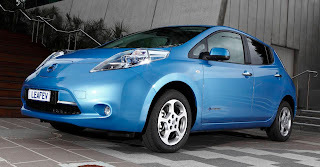 The owners of Nissan LEAF around the world have now covered a total distance of more than 260 million km, greater than the distance from the earth to the sun. All of these kilometers were covered with zero tailpipe emissions, contributing to government's efforts to reduce levels of harmful NOx and particulate matter in cities. The highest mileage LEAF globally has been revealed as a Japanese customer who has covered more than 175,000 km, in a car that has only been on sale for two years. In 17 European countries, 7,000 cars are being driven every day, with one customer in Spain has already clocked up over 43,000 km in one year. This is far beyond an average annual mileage and the rapid build up of mileage is testament to the reliability of the award winning EV. This is further demonstrated by its extraordinary customer satisfaction rating of over 95%, the highest of any Nissan vehicle. In the last 12 months Europe registered significant growth of the CHAdeMO quick charging infrastructure. The number of these chargers which allow batteries to be recharged from empty to 80% battery capacity in around 30 minutes has rocketed from 158 to 601 in the last 12 months. The plans already in place are to more than double by the end of this year the number of installed quick charging installations. These units are being installed at strategic locations such as shopping center car parks or highway service stations, allowing the 50,000 Nissan LEAF owners to push the electric vehicle revolution even further.